Hi. Writing about a small little church isn't easy. Trying to convey to you that we're a great place to be is hard to do in words. You see, we're a small group of about 25 people who come together on Sunday mornings to worship together, trying to figure out how to best live, love, and follow Jesus Christ. The biggest question you probably have is, what happens at Heimtal on Sunday morning? Well, we worship, by which I mean, we sing songs, pray, and listen to what our pastor hopes is a decent sermon. There is no dress code, no political agenda. We usually sing hymns, but when the pastor's partner is feeling up to it, she'll play the guitar instead. Truthfully, we think its cool that we get to sing songs that have been written in the past week, or the past 500 years. While again, we are a small church, we've got someone from every age group to get to know. From 3 years old to 93 (that last number is made up, but you get our point...) Kids stay in worship for the first half of the service, then there is a child message, followed by a class for kids where they learn a neat lesson with fun activities. We try not to get caught up in dogma, theology, or politics. We follow the Moravian motto which states, In the Essentials, Unity; in the Non-Essentials, Liberty; and in All Things, Love. If you're looking for a church were you will not get lost in the crowd, this is the place for you. Come for a visit! Messy Church! A New Adventure at Heimtal. 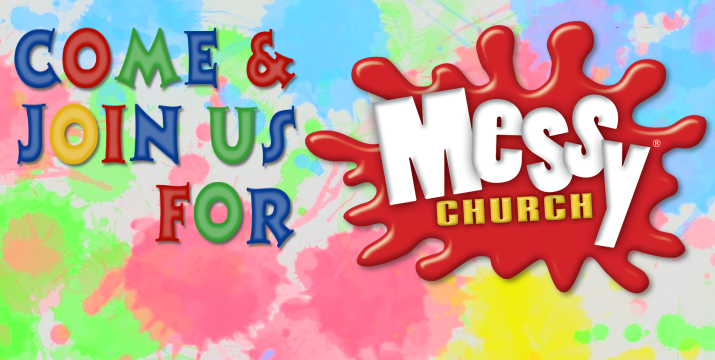 On the Second Saturday of each month, we'll be hosting Messy Church, a 2 hour event which lets you get messy with crafts, games, celebration and food! Messy Church is unique because we engage in tactile games and activities around a central theme each month, but more importantly, its all done together as a family (but you can still join in if you're not part of a family unit). Plus you'll get to meet your neighbours and a free community meal means that you don't have to cook dinner! Join us the second Saturday of the month from 4 - 6 PM. It's great fun! Take 111 Street/James Mowatt Trail 5 KM South from Ellerslie road. The church will be about five minutes down the road on your left. You can take the new bridge off of Highway 2 (not yet on map) and then turn south onto Range Road 250 (aka James Mowatt Trail).